The Republic of Malawi ( IPA: [məˈlɑːwi] or [malaβi]; formerly Nyasaland) is a democratic, densely populated country located in southeastern Africa. It has Zambia to the north-west, Tanzania to the north, and Mozambique surrounding it on the east, south, and west. The origin of the name Malawi remains unclear; it is held to be either derived from that of southern tribes, or noting the "glitter of the sun rising across the lake" (as seen in its flag). The earliest inhabitants of the area were Khoisan hunter-gatherers. They were largely replaced by Bantu tribes during Bantu migrations. The first significant Western contact was the arrival of David Livingstone along the north shore of Lake Malawi in 1859, and subsequently Scottish Presbyterian churches establishing missions. In 1883, a consul of the British Government was accredited to the "Kings and Chiefs of Central Africa," and in 1891, the British established the British Central Africa Protectorate, by 1907, the Nyasaland Protectorate. Although the British remained in control during the first half of the 1900s, this period was marked by a number of unsuccessful Malawian attempts to obtain independence. During the 1950s, pressure for independence increased when Nyasaland was joined with Northern and Southern Rhodesia in 1953 to form the Central African Federation. In July 1958, Dr. Hastings Kamuzu Banda returned to the country after a long absence. He assumed leadership of the NAC, which later became the Malawi Congress Party (MCP). In 1959, Banda was sent to Gwelo Prison in Southern Rhodesia (now Gweru) for his political activities but was released in 1960 to participate in a constitutional conference in London. On April 15, 1961, the MCP won an overwhelming victory in elections for a new Legislative Council. In a second constitutional conference in London in November 1962, the British Government agreed to give Nyasaland self-governing status the following year. This announcement sealed the fate of the Central African Federation, which lost its reason for existence with an independent Nyasaland. Banda became Prime Minister on February 1, 1963, although the British still controlled Malawi's financial, security, and judicial systems. A new constitution took effect in May 1963, providing for virtually complete internal self-government. The Federation of Rhodesia and Nyasaland was dissolved on December 31, 1963, and Malawi became a fully independent member of the British Commonwealth on July 6, 1964. Two years later, Malawi became a republic with Dr. Banda as its first President, and was also declared a one-party state. In 1970 Banda was declared President for life of the MCP, and in 1971 Banda consolidated his power and was named President for Life of Malawi itself. However, increasing domestic unrest and pressure from Malawian churches and from the international community led to a referendum in which the Malawian people were asked to vote for a new form of government. On June 14, 1993, the people of Malawi voted overwhelmingly in favour of multi-party democracy. Free and fair national elections were held on May 17, 1994. Bakili Muluzi, leader of the United Democratic Front (UDF), was elected President in those elections. The UDF won 82 of the 177 seats in the National Assembly and formed a coalition government with the Alliance for Democracy (AFORD). That coalition disbanded in June 1996, but some of its members remained in the government. Malawi's newly written constitution (1995) eliminated special powers previously reserved for the Malawi Congress Party. Accelerated economic liberalization and structural reform accompanied the political transition. Malawi saw its first transition between democratically elected presidents in May 2004, when the UDF’s presidential candidate Bingu wa Mutharika defeated MCP candidate John Tembo and Gwanda Chakuamba, who was backed by a grouping of opposition parties. Through the politicking of party chairperson and former President Bakili Muluzi, the party successfully secured a majority by forming a "government of national unity" with several opposition parties. For almost thirty years, the government of Malawi and the Malawi Congress Party were one. When Malawi was declared a republic in 1966, the country was formally declared a one-party state. Under Banda, all citizens had to be members of the party. This situation changed in a 1993 referendum, which instituted a multiparty system. In the country's first democratic elections, Banda and the MCP were soundly defeated. Under the 1995 constitution, the president, who is both chief of state and head of the government, is chosen through universal direct suffrage every five years. Malawi has a vice president who is elected with the president. The president has the option of appointing a second vice president, who must be from a different political party. The members of the presidentially appointed cabinet can be drawn from either within or outside of the legislature. Malawi's National Assembly has 193 seats, all directly elected to serve 5-year terms. The constitution also provides for a second chamber, a Senate of 80 seats, but to date no action has been taken to create the Senate. The Senate is intended to provide representation for traditional leaders and the different geographical districts, as well as various special interest groups, such as women, youth, and the disabled. The constitution provides for an independent judiciary. Malawi's judicial system, based on the English model, is made up of magisterial lower courts, a High Court, and a Supreme Court of Appeal. Local government is carried out in 27 districts within three regions administered by regional administrators and district commissioners who are appointed by the central government. Local elections, the first in the multi-party era, took place in on November 21, 2000. The UDF party won 70% of the seats in this election. Malawi is situated in southeastern Africa. It has the Great Rift Valley running through the country from north to south. In this deep trough lies Lake Malawi (also called Lake Nyasa), the third-largest lake in Africa, making about 20% of Malawi's area. The Shire River flows from the south end of the lake and joins the Zambezi River 400 km (250 mi) farther south in Mozambique. East and west of the Rift Valley are high plateaus, generally between 900 and 1,200 m (3,000–4,000 ft) above sea level. The Nyika Uplands rise as high as 2,600 m (8,500 ft) in the north; south of the lake lie the Shire Highlands, with an elevation of 600–1,600 m (2,000–5,000 ft), rising to Mts. Zomba and Mulanje, 2,130 and 3,048 m (7,000 and 10,000 ft). In the extreme south, the elevation is only 60–90 m (200–300 ft) above sea level. Malawi is one of Sub-Saharan Africa's most densely populated countries. Lilongwe, Malawi's capital since 1971, has a population which exceeds 400,000. All government ministries and the Parliament are located in Lilongwe. Blantyre remains Malawi's major commercial centre and largest city, having grown from an estimated 109,000 inhabitants in 1966 to nearly 500,000 in 1998. Malawi's President resides in Lilongwe. The Supreme Court is seated in Blantyre. Malawi's climate is subtropical. A rainy season runs from November through April. There is little to no rainfall throughout most of the country from May to October. It is hot and humid from October to April along the lake and in the Lower Shire Valley. Lilongwe is also hot and humid during these months, albeit far less than in the south. The rest of the country is warm during those months. From June through August, the lake areas and far south are comfortably warm, but the rest of Malawi can be chilly at night, with temperatures ranging from 5 °–14 °C (41°–57°F). Lake Malawi is sometimes called the Calendar Lake as it is about 365 miles long and 52 miles wide. Malawi has five national parks: Cape Maclear; Kasungu; Lengwe; Liwonde; and Nyika. Malawi is a landlocked, densely populated country. Its economy is heavily dependent on agriculture. Malawi has few exploitable mineral resources. Its three most important export crops are (in order) tobacco, tea and sugar. Malawi's president recently urged farmers to consider growing other crops, such as cotton ( ), as an alternative to the country's principal crop, tobacco, as cigarette consumption in the West continues to decline. Traditionally Malawi has been self-sufficient in its staple food, maize, and during the 1980s exported substantial quantities to its drought-stricken neighbors. Agriculture represents 38.6% of the GDP, accounts for over 80% of the labor force, and represents about 80% of all exports. Nearly 90% of the population engages in subsistence farming. Smallholder farmers produce a variety of crops, including maize (corn), beans, rice, cassava, tobacco, and groundnuts ( peanuts).The agricultural sector contributes about 63.7% of total income for the rural population, 65% of manufacturing sector’s raw materials, and approximately 87% of total employment. Financial wealth is generally concentrated in the hands of a small elite. Malawi's manufacturing industries are situated around the city of Blantyre. Malawi has undertaken economic structural adjustment programs supported by the World Bank, the International Monetary Fund (IMF), and other donors since 1981. Broad reform objectives include stimulation of private sector activity and participation through the elimination of price controls and industrial licensing, liberalization of trade and foreign exchange, rationalization of taxes, privatization of state-owned enterprises, and civil service reform. Malawi qualifies for Heavily Indebted Poor Countries (HIPC) debt relief. As of late May 2004, the IMF program (begun in 2000) was canceled and a Staff-Monitored Program (SMP) was implemented. In the wake of questions about fiscal credibility, the SMP’s goal is to give Malawi’s newly-elected government the chance to establish a track record of fiscal discipline. Child mortality is 103/1,000. There are more than a million orphans, 700,000 of whom became orphans when their parents died of AIDS. According to Malawi government estimates, 14.2% of the population are HIV-positive, and 90,000 deaths in 2003 were due to AIDS. Unofficial estimates based on private hospital entries give a HIV infection percentage of 30%. Malawi's staple food is maize but like other countries in Southern Africa, Malawi has repeatedly been affected by famines since 2002, when food was scarce for almost one third of the population. In 2003, 30 percent of the population were affected. According to a FAO report from June 2005, 4.22 million inhabitants of Malawi, ¼ of the population, would not have enough food in 2005 to survive. In the south of the country, the rate of the population affected will be between 55 and 76 per cent. In the end of November 2005, the first famine deaths were recorded. Some relief organisations, such as the Community of Sant'Egidio, Catholic Relief Services and other local and international organisations try to respond to the famine by distributing food parcels. The government also had a starter pack farm input programme for maize seed and fertilizer. The scheme was however subject to gross abuses and sometimes the poorest people did not receive any of the items that were purportedly earmarked for them. This programme was discontinued by the Bingu Wa Muntharika administration, which instead subsidised fertilizer for the local subsistence farmers. Between 1985 and 1995, Malawi accommodated more than a million refugees from Mozambique. The refugee crisis placed a substantial strain on Malawi's government but also drew significant inflows of international assistance. The accommodation and eventual repatriation of the Mozambicans is considered a major success by international organizations. In 1996, Malawi received a number of Rwandan and Congolese refugees seeking asylum. The government did not turn away refugees, but it did invoke the principle of "first country of asylum." Under this principle, refugees who requested asylum in another country first, or who had the opportunity to do so, would not subsequently be granted asylum in Malawi. There were no reports of the forcible repatriation of refugees. Important bilateral donors, in addition to the U.S., include Canada, Libya, Germany, Iceland, Japan, the Netherlands, Norway, Finland, Sweden, Taiwan, and the United Kingdom. Multilateral donors include the World Bank, the IMF, the European Union, the African Development Bank, and the United Nations organizations. Malawi is a member of the following international organizations: UN and some of its specialized and related agencies (i.e. UNCTAD, UNESCO, UNIDO), IMF, World Bank, Multilateral Investment Guarantee Agency (MIGA), World Intellectual Property Organization (WIPO), Berne Convention, Universal Copyright Convention, African Union, Lome Convention, African Development Bank (AFDB), Southern African Development Community (SADC), the Common Market for Eastern and Southern Africa (COMESA), Nonaligned Movement, G-77, and the World Health Organization (WHO). Malawi is also a member of the International Criminal Court with a Bilateral Immunity Agreement of protection for the US-military (as covered under Article 98). Malawi derives its name from the Maravi, a Bantu people who came from the southern Congo basin circa 1400. On reaching the area north of Lake Malawi, the Maravi divided. One branch, the ancestors of the present-day Chewas, moved south to the west bank of the lake. The other, the ancestors of the Nyanjas, moved down the east bank to the southern part of the country. By 1500, the two divisions of the tribe had established a kingdom stretching from north of the present-day city of Nkhotakota to the Zambezi River in the south, and from Lake Malawi in the east, to the Luangwa River in Zambia in the west. Migrations and tribal conflicts precluded the formation of a cohesive Malawian society until the turn of the 20th century. In more recent years, ethnic and tribal distinctions have diminished, although regional distinctions and rivalries persist. Despite some clear differences, no significant friction currently exists between tribal groups, and the concept of a Malawian nationality has begun to take hold. 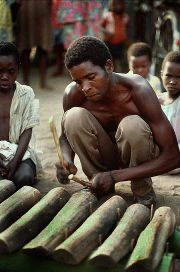 Predominantly a rural people, Malawians are generally traditionalist, which includes nonviolence. The Chewas constitute 90% of the population of the central region; the Nyanja tribe predominates in the south and the Tumbuka in the north. In addition, significant numbers of the Tongas live in the north; Ngonis—an offshoot of the Zulus who came from South Africa in the early 1800s—live in the lower northern and lower central regions; and the Yao, who are mostly Muslim, live along the southeastern border with Mozambique. Bantus of other tribes came from Mozambique as refugees. Europeans and Asians also live here. Most Europeans are British and Portuguese from Mozambique, and Asians are mostly Indians.